Swale aims to turn public art into public service by providing free fruits and vegetables to all. In the spring of 2010, The New York Times made a mistake that required more than a sidebar correction. “On Second Thought, Don’t Eat the Plants in the Park,” read the City Room blog headline. The story retracted earlier advice to pick the delicious daylily shoots in Central Park. It’s illegal, for starters—but there was something else. This is the principle behind the tragedy of commons, an economic theory that says shared spaces result in selfishness. It’s a theory Swale—a free-to-all floating garden docked at Brooklyn Bridge Park’s Pier 6—has disproved since it began traveling New York’s waterways in June. “Nobody has really overpicked,” said artist Mary Mattingly, who helped design the garden. That people would show care, generosity, and enthusiasm for the shared space was always the hope—but it became “the thing we have definitely learned on this project,” Mattingly said. 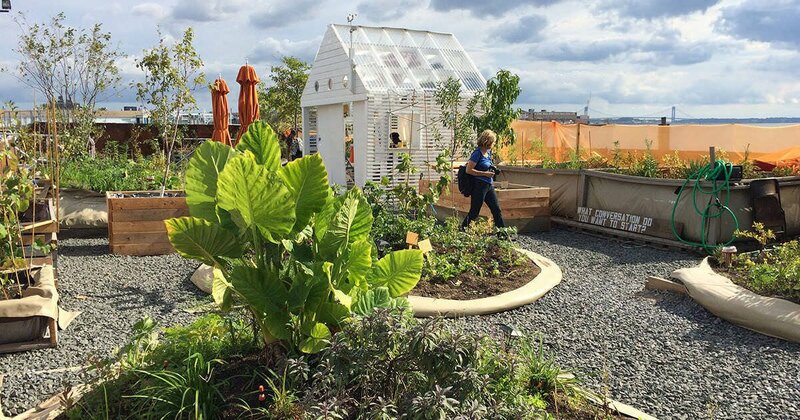 Working with a host of collaborators, Mattingly planted a 130-by-40-foot floating platform garden that’s produced an edible Eden of fruits and vegetables: raspberries, grapes, strawberries, apples, persimmons, potatoes, asparagus, bok choy, chamomile, and comfrey. It’s a project that sits at the intersection of public service and public art, and because it’s on the water, Swale slips through the city’s prohibition on growing and picking food in public spaces. About 500 people wander through the space each day, discovering the medicinal properties and uses for the plants and herbs and harvesting whatever they please. The perennial garden was designed according to food forest principles. The low-maintenance design system uses companion planting to add nitrogen to the soil, which creates a productive hybrid of garden, orchard, and woodland. The barge has docked throughout the city, but the response has been most enthusiastic in Brooklyn, Mattingly said. The borough has the greatest food insecurity in the city, according to a study released in September by the Food Bank for New York City, a finding that surprised even the boss of the organization. Swale’s mission differs from that of more traditional antihunger organizations, which might focus on finding support and food for families to eat after benefits from state and federal nutritional assistance programs and free school lunches have been exhausted. Rather, it aims to “reimagine food as a public service” in which more fresh food could be available for free and accessible to people throughout the city. “Food as a public service is thinking about ‘Can New York City Parks change their maintenance plan slightly so that it accommodates more perennial edibles?’ ” Mattingly said. In addition to grocery stores, farmers markets, and community gardens, the city’s public green spaces could also grow food-forest gardens. It seems more possible than ever. This month, Swale held a public panel discussion with the New York City Department of Parks and Recreation, the U.S. Forest Service, and community garden representatives to talk about foraging concerns and how to make safe spaces for public food production in the city. The parks department’s concerns are numerous but “not insurmountable,” Mattingly said. Until next month, when the barge will travel upstate to overwinter, visitors can fill a tote bag with kale, taste a leaf of comfrey, or gather a handful of mint. They can taste and touch and start talking. Being parked at bustling Brooklyn Bridge Park—amid soccer games and barbecues and throngs of people—brings the issues of food accessibility front and center. Thank you to TakePart.com for allowing us to repost this article. What do you think of this idea? 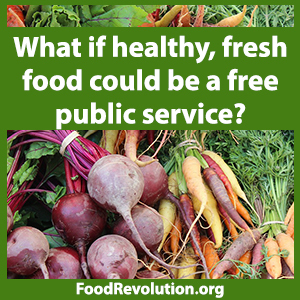 Should food forests be in more places? Tell us in the comments what you think.